After months of anxiety and high expectations I could finally watch "The Girl With the Dragon Tattoo" ; as much as I did not want to resort to a cliché to describe the film it’s impossible for me to avoid it: it is a masterpiece. Perfect in every detail, visually stunning, with a fantastic cast and amazing music. Dark and gloomy as the book itself and as only Fincher – or maybe Cronenberg – could deliver. The text below might contain spoilers, so if you haven’t watched the movie yet, please, scroll down to the recipe. I tried watching a movie last night but simply could not concentrate on it – I’d start to think of scenes of “TGwtDT” every 5 minutes or so, to remember the details, to connect them with the book, and to analyze the performances... The movie stays with you, you just cannot help it – it sticks to your head like glue. Rooney Mara blew me away – forgive me the purists, but she completely erases Noomi Rapace from one’s memory. Christopher Plummer is exactly what I expected Henrik Vanger to be. I am a die-hard fan of the book but did not mind the changes on the script – I thought the whole thing worked. The violent scenes are not easy to watch but they’re there for a reason – the audience cheers for Lisbeth, we want her to have her revenge. She’s not your regular heroine and her behavior is nothing like a fairy-tale girl’s, but that is exactly what makes her so special, so unique, and I think that Fincher and Mara captured that perfectly and brought it to a whole new level – that is the Lisbeth I imagined while reading the book, that is the girl that made me devour 2,000 pages. I drove home trying to remember the last time a movie had had this effect on me and after hours of thought I came to the conclusion that it’d been "The Social Network" . Fincher, my hero. No wonder I feel joy in my heart every time I read he’s into a new project – I know for sure it will be something amazing. Now all I can do is cross my fingers and hope he directs the next two movies of the trilogy. Preheat the oven to 180°C/350°F. Line a large baking sheet with foil and brush the foil with olive oil. Arrange the tomatoes, cut side up, onto the prepared sheet. Sprinkle with salt and pepper, drizzle with olive oil and scatter the garlic and basil over the tomatoes. Roast the tomatoes for 30-35 minutes or until soft. 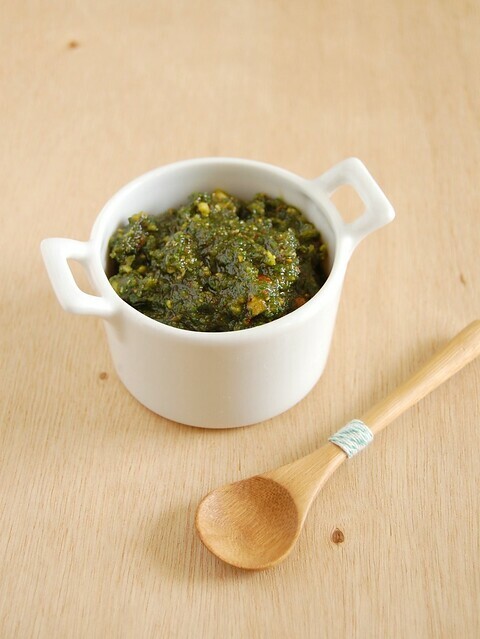 Meanwhile, make the pesto: bring a small saucepan of water to a boil. Fill a medium bowl with ice cubes and water. Add the basil leaves to the boiling water, cook for 30 seconds, then drain and transfer to the ice water. When cool, drain well then squeeze the basil between sheets of paper towels until almost completely dry. Put the basil in a food processor with the garlic, lemon zest, oil, and salt. Puree until smooth. Add the pistachios and pulse until coarsely chopped (or to your liking). Transfer to a bowl and stir in the cheese. Cook the pasta in a large saucepan of salted boiling water until al dente. Drain the pasta (set aside some of the cooking water). 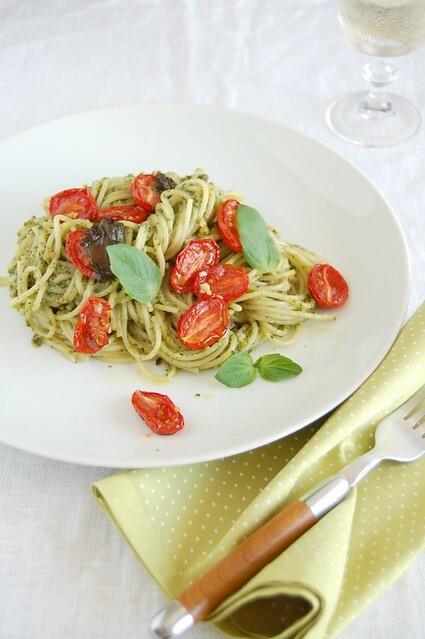 Toss the pasta with the pesto, adding a bit of the water if necessary to loosen up the sauce. Divide the pasta into plates and cover with the roasted tomatoes. Serve at once. Seriously cant take my eyes from ur irresistible click,super tempting spaghetti..
Looks lovely.. What is the advantage of boiling the basil before using it for pesto? thanks..
do you recommend the movie, without having read the book? Lovely meal I might say too. I'm also a huge fan of the Girl with the Dragon Tattoo - agreed, the American version's casting was just perfection! Tell me, did you like the movie? Ha. I enjoyed it, but it's hard to be blown away when I know the ending! For me, anyway. Thank you! I have been pondering a new pasta dish to prepare for company this weekend and yours looks divine. I am a little confused as to how blanching the basil leaves will affect the flavor and/or texture of the pesto, but I suppose I will find out! I do want to see the movie, but I am still recovering from last years Swedish version. Wonderful yet tres violent and disturbing. Hooraaay!! I cannot wait to watch it! Have been waiting for too long already!! Feli, the basil will turn incredibly greener this way. Abby, the score was AMAZING! Modern and gloomy, just like the movie. Miss McBooty, they're pretty expensive around here too - such a shame! That looks highly tempting to try! I came back just to look at your pasta picture - it's so gorgeous.